Seattle harbors a dark and violent history that stretches back to a bloody battle between natives and settlers in 1856. In the early 1900s, Dr. Linda Hazzard stole money from countless patients after starving them to death in her infamous sanitarium. Three robbers opened fire in the notorious Wah Mee gambling club in 1983, killing thirteen people in the state's deadliest mass homicide. Some of America's most notorious serial killers wrought terror in Seattle, including the Green River Killer, Gary Ridgway. Ted Bundy's murder spree started in King County before reaching national attention in the 1970s. 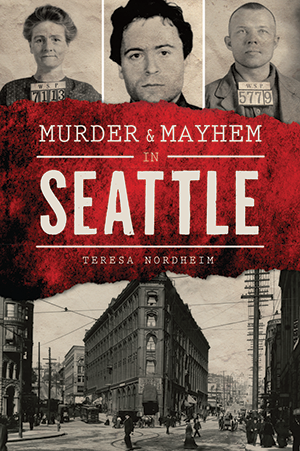 Local author Teresa Nordheim exposes these and many more gruesome events that scarred the city. Teresa Nordheim is an award-winning author who has over forty published articles to her credit. This mother, nurse and researcher gets her inspiration from such authors as William Shakespeare, Edgar Allen Poe and Isaac Asimov. Teresa is a freelance writer and illustrator. She is also an avid paranormal investigator and director of research for AGHOST (Advanced Ghost Hunters of Seattle–Tacoma).